Popular destination wedding venues and locations compiled in a list will help you decide the best option for your wedding. You can explore the different amenities offered at each location to determine if the venue will provide everything you want. Skip the passports and stay in the U.S. to make your wedding planning easy. Floating near the very top of The Knot's Top 50 destination spots is Tucson, Arizona. From the year-round warm weather to the scenic landscapes that include cacti and sunsets like you've never seen before, Tuscan is the perfect location for anyone who desires a Southwest appeal, or rugged (albeit gorgeous) scenery. Your guests will have plenty to do outside of the ceremony, including hiking in the Sabino Canyon, or shopping for local textiles and jewelry as mementos from their trip. 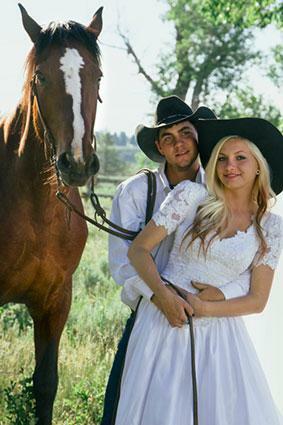 My Wedding offers an extensive list of Tucson venus to set the stage for your 'I dos,' while Tuscon Lifestyle magazine offers up an annually published wedding issue dedicated to every detail of putting on the perfect Tucson wedding. Hawaii and its islands, coasts, and cities are included on numerous lists of destination wedding spots with good reason. EscapeHere places it in the number one spot for their Top 15 Destination Wedding Spots in the World list, noting that the beaches, cliffs, and mountains "make Hawaii a very popular place" for weddings. Fodor's Travel's World's Best Places for a Destination Wedding calls out the island of Kauai for its "laid-back vibe and pristine beaches," and it's frequently listed as a top destination for a beach wedding. If you're looking for something truly spectacular venue, Condé Nast Traveler highlights Modern Honolulu as one of the most beautiful wedding venues in the U.S. with walking down the aisle over water as one of the major highlights. Hawaii is a wonderful tropical location that offers sunny skies and steady temperatures during their dry season. Consider getting married in Hawaii if you want a tropical location without heading outside the United States. If you want to roll your wedding and honeymoon into one trip, The U.S. Virgin Islands is a great option. Being a U.S. territory makes quite simple. Visit one of the three islands for your wedding and then visit the other two after your nuptials. No passport is needed as it is a United States territory, which makes wedding planning easier than international destinations. USA TODAY's 10Best list of Best Wedding Destinations also includes the Virgin Islands for similar reasons and notes coral reefs, parasailing, and other adventures for couples and guests who want to explore the area. If a cruise wedding may seem enticing but nuptials on top of the water don't entice you, Bar Harbor offers coastal charm without the risk of seasickness. Destination Weddings & Honeymoons includes Bar Harbor as one of 10 perfect U.S. based destination wedding spots. They aren't the only ones who thinks this picturesque, romantic coastal town of Maine is the perfect spot for getting married. The Knot's Top 50 Destination Wedding Spots includes Bar Harbor as well, noting the "iconic lighthouses" and activities like kayaking and whale watching. Not everyone who wants a beach wedding wants a tropical location. If you'd rather have a New England or Nantucket feel to yours, consider Bar Harbor and its gorgeous scenery. No list of popular wedding locations would be complete without mentioning the mecca of marriage - Las Vegas, Nevada. Both Destination Weddings & Honeymoons and Fodor's Travel include the city for the various options for nuptials, from drive-through chapels to swanky hotels. Getting married in Las Vegas can be as simple or luxurious as you desire, making it perfect for almost anyone's destination budget. Las Vegas is the ultimate getaway for many couples. Numerous venues boast family-friendly entertainment and the nightlife can't be beat. It truly offers something to fit almost every couple and guest. While planning an international wedding is more involved than one in the U.S., it will be an event that everyone remembers for years. Consider hiring a wedding planner to help coordinate vendors and legalities if you find planning an international wedding stressful. You don't need to travel too far from the U.S. to find yourself in a breathtakingly beautiful international location. Cabo San Lucas, Mexico is a hop, skip and a jump away, making it easier for your guests to travel, but it still feels like a different world. Other notable pluses include the ability to use U.S. currency, English-speaking locals, the large number of restaurants, and plenty of outdoor activities including snorkeling and jet skiing. The area also makes the list of popular destinations from CBS Chicago. 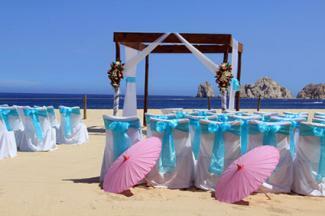 Consider one of Cabo San Lucas's many all inclusive resorts for your nuptials to make planning easy. Plenty of things to do in the area, from sport fishing to nightlife, will keep your guests busy throughout their stay. Getting married in Thailand provides an exotic backdrop to even the most traditional of weddings. Anantara Phuket Villas in Phuket was specifically named by The Wedding Community as one of the Top 5 Weddings Abroad Destinations for its culture, history, landscape, waters, and beaches. The Wedding Bliss points out other popular areas in Thailand for weddings, including Koh Samui, Hua Hin, Krabi, Chiang Mai, and Bangkok. Travel to Thailand for your wedding for a truly unique experience. Whether you choose to marry in a religious venue or on one of their beaches, you will be immersed in the culture for your stay. If you love the idea of a beach wedding but don't want to sacrifice an ounce of glamour, then Aruba (nicknamed 'the happy island') might be your perfect destination. Named as one of the 10 Caribbean Islands Perfect for a Destination Wedding by Destination Weddings & Honeymoon, this stunning island offers a range of experiences from high rise beach front resorts complete with all-inclusive wedding services, to romantic, natural settings. 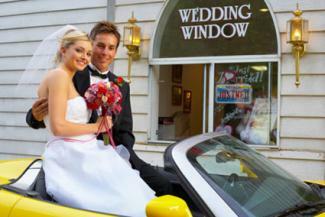 My Wedding offers an extensive list of wedding venues, packages and resorts. A quick tip: look to the western beaches for the best sunset ceremonies. EscapeHere notes that South Africa is becoming "increasingly popular" due to the various outdoor activities available for couples and guests, and places it third on their list of top destinations. Several places to wed throughout the area include Strandkombuis, Langverwagt, Allee Bleue, Sabi Sabi, Molenvliet, and Morrells Boutique Venue. Learn what you need to bring to make your marriage legal by checking with the Department of Home Affairs before traveling. Adventurous couples may want to consider booking safaris and tours to make the most of their trip. Affordable villas help land Tuscany, Italy on Destination Weddings & Honeymoon's list. The Wedding Community also recognizes Tuscany as a great destination, noting the famous city of Florence but also calling out the countryside, gardens, historic churches, and "quaint" towns. 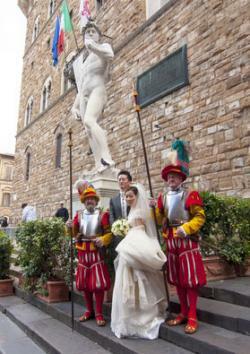 Fodor's Travel's list describes Florence as an area rich with the arts for a destination wedding. Although Venice and Rome may be popular places to travel in Italy, consider the Tuscan region if you want a country wedding with rustic flair. 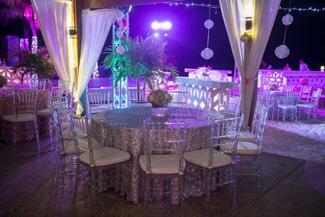 The artistic and scenic backgrounds are sure to create a memorable trip and ceremony. A beautiful wedding can occur virtually anywhere in the world. Consider picking a popular spot that you've always wanted to visit, and start making plans to celebrate your love in a festive destination location.